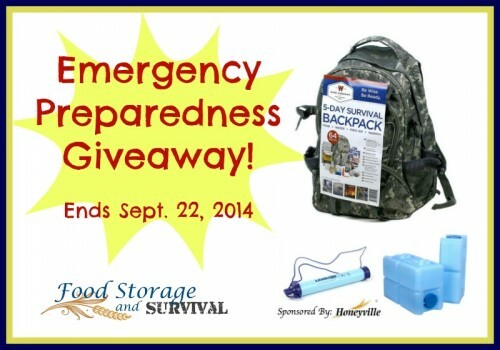 Emergency Preparedness Giveaway PLUS Honeyville Coupon Code! How about another giveaway celebrating National Preparedness Month? This is a fun one, sponsored by Honeyville Grain. Since 1951 Honeyville has grown from a specialty grain mill into a national food supplier leader specializing in storable foods, quality baking ingredients, and kitchen appliances. We strive to offer excellent quality foods at competitive prices to all of our customers no matter what your volume requirement is. 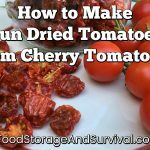 Honeyville’s diverse line of products includes freeze dried and dehydrated foods, whole grains, flours, baking ingredients, canned foods, corn products, and much, much more. LifeStraw personal water filter These are GREAT. Check out the review I did on the LifeStraw here! Two Water Bricks I also love Water Bricks! Super sturdy and a great size for sliding under beds or stacking in closets. Plus you can probably even carry it full (unlike a 55 gallon drum!). If you get over to Honeyville’s site and decide there is more you want, use coupon code READY10 to get 10% off your entire order through this Friday, 9/19/14, and they always offer $4.99 flat rate shipping anywhere in the continental US!